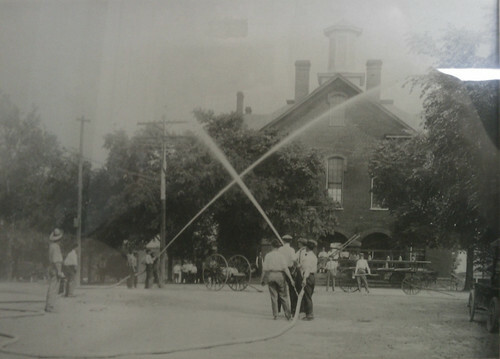 First volunteer fire company of Carthage. Organized by C.F. Leavitt in 1913 who was chief for 18 years. The equipment was designed by C.F. Leavitt and Mr. Andrew Lawhorn and built by Mr. Lawhorn. Ones known on pictures C.F. Leavitt, C.F. Barnes, W.E. Porter, T.L. Black, Charlie Barringer, Allie and Charlie McDonald, C.M. Muse, Leon Muse and Alex Dawson. 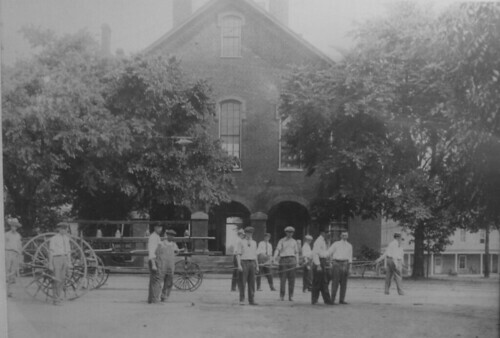 Building is Old Moore County Courthouse.